Electric fireplaces are quickly becoming one of the most popular features in many homes (and even mobile homes)! They are efficient and easy to install, making them an ideal choice whether you rent or own your home. With all the new models coming out every season, how do you choose which electric fireplace to buy? We’ll show you everything you need to know so that you can get the perfect electric fireplace for your space. Electric fireplaces are heating appliances meant to mimic the look of a gas or wood-burning fireplace. Unlike gas or wood-burning fireplaces which work through combustion, they produce heat for your room by taking in cool air, heating it up, and blowing out warm air with a fan. The average electric fireplace can heat rooms that are approximately 400 square feet. They don’t require venting and many don’t even require professional installation; just plug them in and go. In many electric fireplaces the heater works independently from the flames which means you can use your electric fireplace year-round. Enjoy the warmth of the heater in the chilly months or turn it off and leave the flames on for ambiance in the summer. Some even have a nightlight feature for added functionality in your home. The flames in electric fireplaces are not real. They’re impressive light displays that reflect against different materials inside the electric fireplace, such as metal or mesh, to mimic the look of real flames. Because they’re created with lights, many units allow you to change the colors of the flames to create unique light displays. Some of the newer models even have steam technology, such as Modern Flames and Dimplex, to create the natural look of smoke. Electric fireplaces come in a large array of different styles. Depending on the decor of your space, the size of the space available, and what you want to use it for, different styles will suit different needs. If you’re low on floor space, a wall mounted electric fireplace would work great in your space. You can hang them on a wall much like you would a picture frame. You could also build them into the wall and hardwire them. Maybe you want the look of a traditional fireplace. If so, you might like electric fireplace mantel packages. They look just like traditional fireplace with a mantle built around the unit to give you an authentic feel. No matter what your style or need is, there is an electric fireplace perfect for you! Electric fireplace media consoles are a great option if you want the ease and convenience of an electric fireplace with added functionality. By choosing a media console, you are saving space by combining the hearth and media areas of your room. 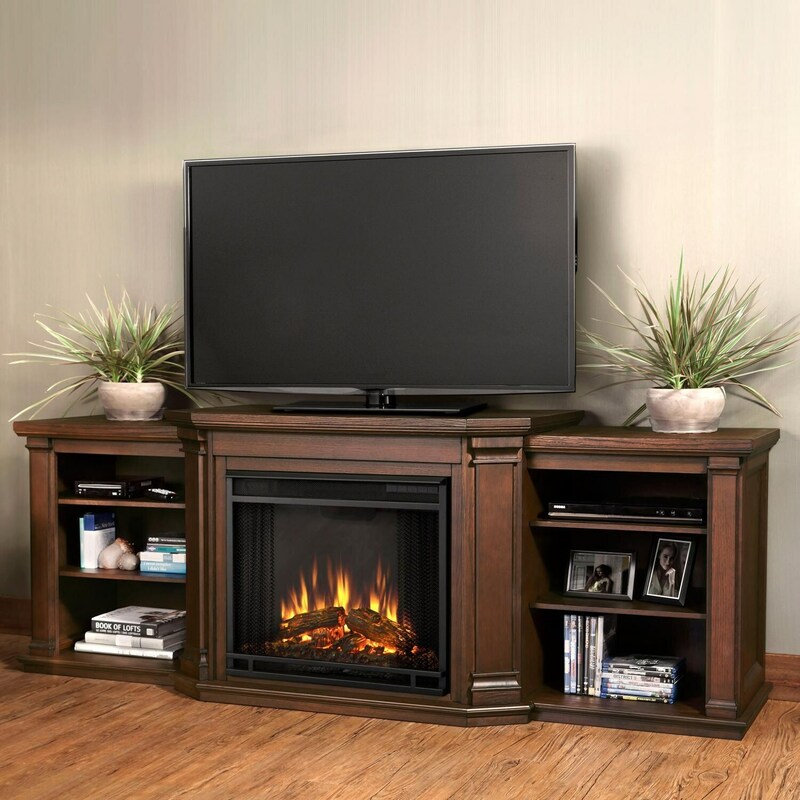 Not only will your electric fireplace provide décor and warmth for your room, but it gives you a place for your TV and storage space for movies, books, and more. Electric fireplaces with mantels are the perfect solution if you like the look of a traditional fireplace. 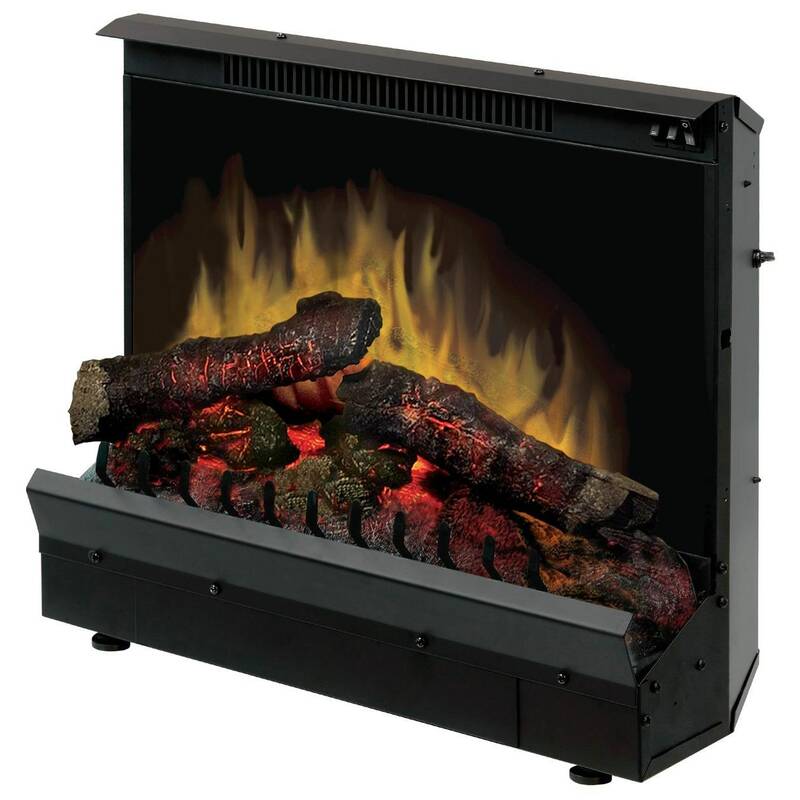 Mantel packages include the mantel and firebox insert. All you have to do is place the firebox inside the mantel, plug it in, and you are ready to enjoy the ambiance and warmth of a fire. There are several options of electric fireplace mantels including stone, traditional wood, and modern white finishes, with media options of logs, embers, and fire glass. Wall Mount Electric Fireplaces are ideal for small apartments or smaller rooms in your home where floor space may not be available. Simply hang your electric fireplace on the wall and plug in, instantly brightening and warming your room. There are also semi-recessed and fully recessed wall mount electric fireplaces, which are more permanent options. Semi-recessed electric fireplaces are partly recessed into your wall, but have a few inches protruding out. Fully recessed electric fireplaces are flush mounted in your wall, and the blowers are located on the front so your room will still be heated. No matter which one you choose, you will have a beautiful work of art on your wall in no time. Built-in electric fireplaces save valuable floor space by being built into an opening in your wall. Since this will require professional hardwiring and creates a permanent fireplace, we suggest a built-in electric fireplace only if you own your home and are not renting. 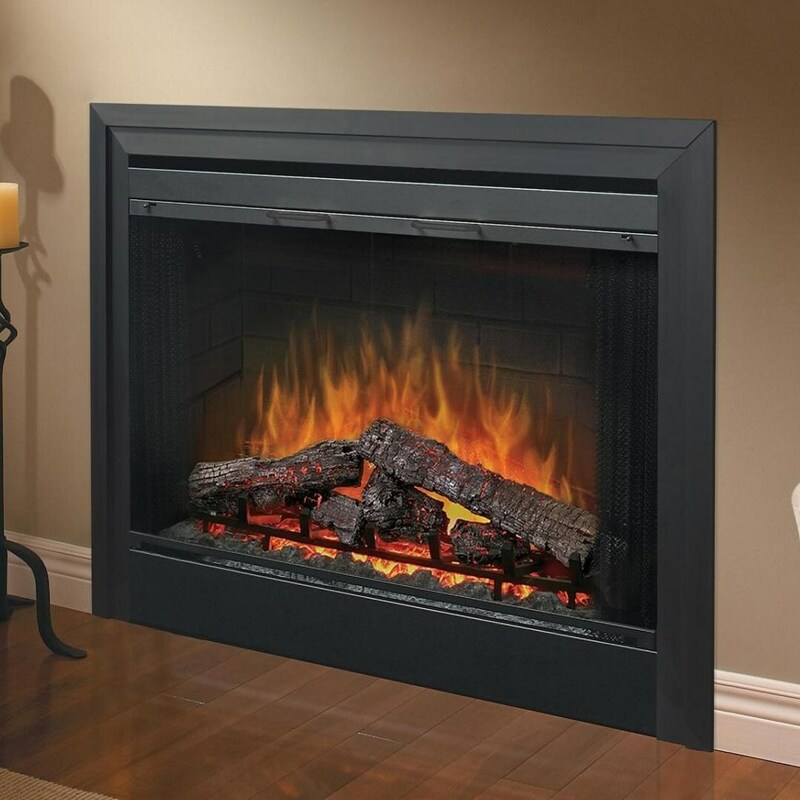 Electric fireplace inserts are similar yet different than built-in electric fireplaces. Unlike built-in electric fireplaces require the wall be cut out/customized exactly to the unit’s dimensions and electric fireplace inserts are designed to easily fit into a pre-existing wood-burning fireplace. 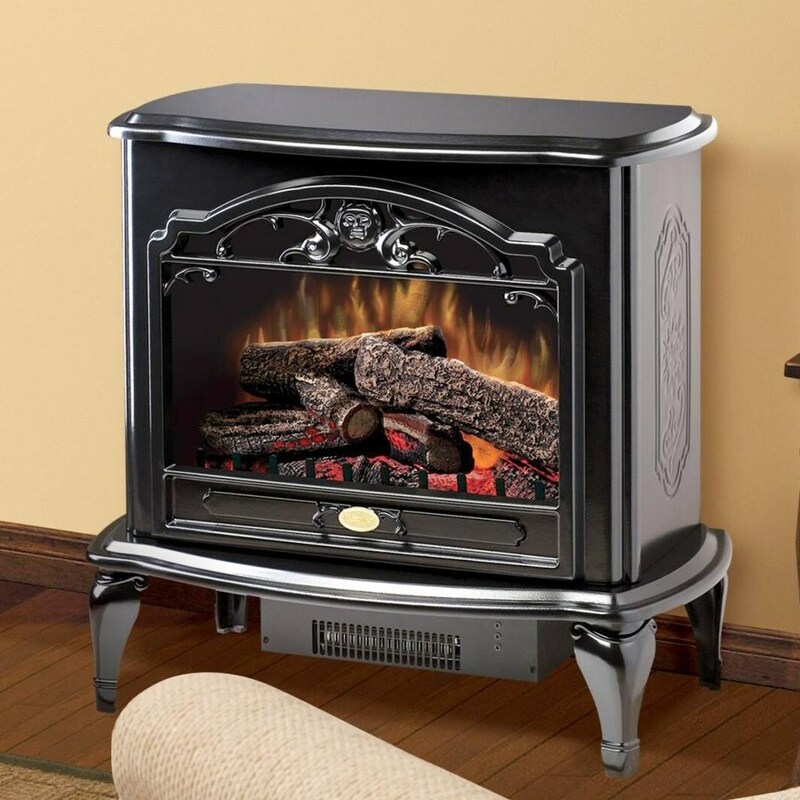 Electric stove heaters are beautiful heaters meant to mimic the look of traditional wood-burning stoves. They’re perfect for adding a cozy cabin look to your space without the hassle of bringing in real wood and the cleanup that comes with it. Did you know that there are electric fireplaces rated for outdoor use? 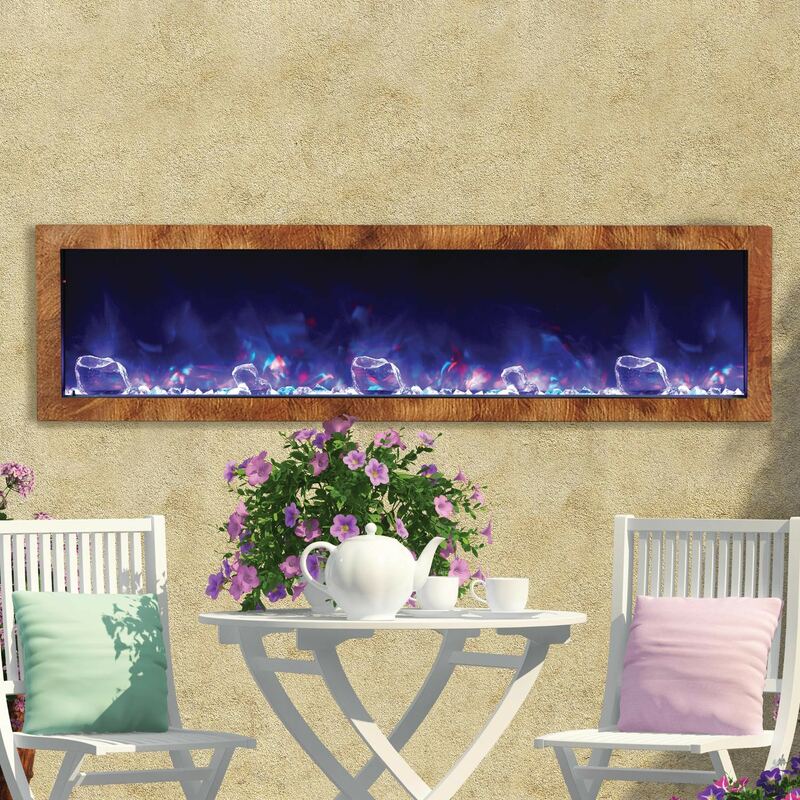 Add a little extra ambiance to your patio with the dancing flames of an electric fireplace. They provide ambient light and serve as a focal point and conversation-starter. Can you place a TV over an electric fireplace? Yes, you can place a TV over an electric fireplace. Electric fireplace media consoles are designed to hold a TV, so you can place the TV right on top of them. For built-in electric fireplaces, wall mount fireplaces and electric stove heaters, it’s recommended you leave around 6” to 8” of space between the electric fireplace and the TV if your electric fireplace has a heater attached. For a wall mount electric fireplace, you’ll want it to be sized larger than your TV. This is mainly an aesthetic recommendation to avoid them looking awkward together. Now that you’ve decided on the style, you can check out all the cool features that electric fireplaces have to offer. Most electric fireplaces include a remote for you to control the temperature and features such as flame brightness and speed, but there are a few features that truly stand out to us. Read below to find out more! 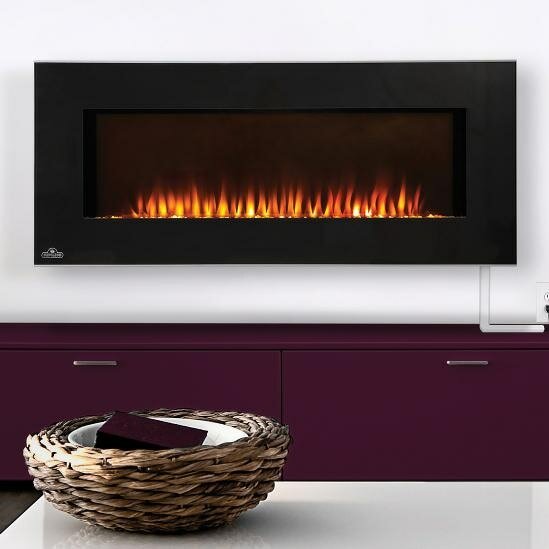 Changing Flame Colors: Some electric fireplaces from brands such as Amantii, Modern Flames, and Napoleon fireplaces feature changing flame colors with just the touch of a button. Flame colors can include blue, orange, yellow, purple, multi-color, and depend on the brand. This is an easy and cool way to customize the appearance of your electric fireplace each time you use it. Cool to the Touch Glass: Cool to the Touch Glass is featured in electric fireplaces with fire glass, such as ClassicFlame’s. The glass remains cool to the touch whether the heat is on or off, making this safe for children and your whole family. Smoke Effect: Featured in Dimplex electric fireplaces with the patented Opti-Myst technology, a fine water mist that reflects light is produced, resulting in an extremely realistic 3D flame and smoke effect. This is achieved with the easy-to-fill water tank that allows for 12-14 hours of operation when full. Before you decide which type of fireplace you would like, you first need to measure your space. If you will be using your electric fireplace as a heat source, make sure to measure the square footage of your room to ensure the fireplace you choose will heat your entire room. Whether you want a built-in, wall mount, mantel, or media console, know what size you are looking for so you can narrow down your options. If you're short on floor space, wall mounted electric fireplaces or built-in electric fireplaces are great options to consider. If you have space to spare, electric fireplace mantel packages bring a traditional look to your space and electric fireplace media consoles provide the function of a media center for your room. If you're looking for an efficient source of heat, electric fireplaces are the right choice! Depending on your electrical rates, most electric fireplaces have an operating cost around 3 cents per hour without heat and 8 cents per hour with heat. For homeowners who are seeking a green lifestyle, electric fireplaces are also a great choice; there are no harmful emissions to worry about. 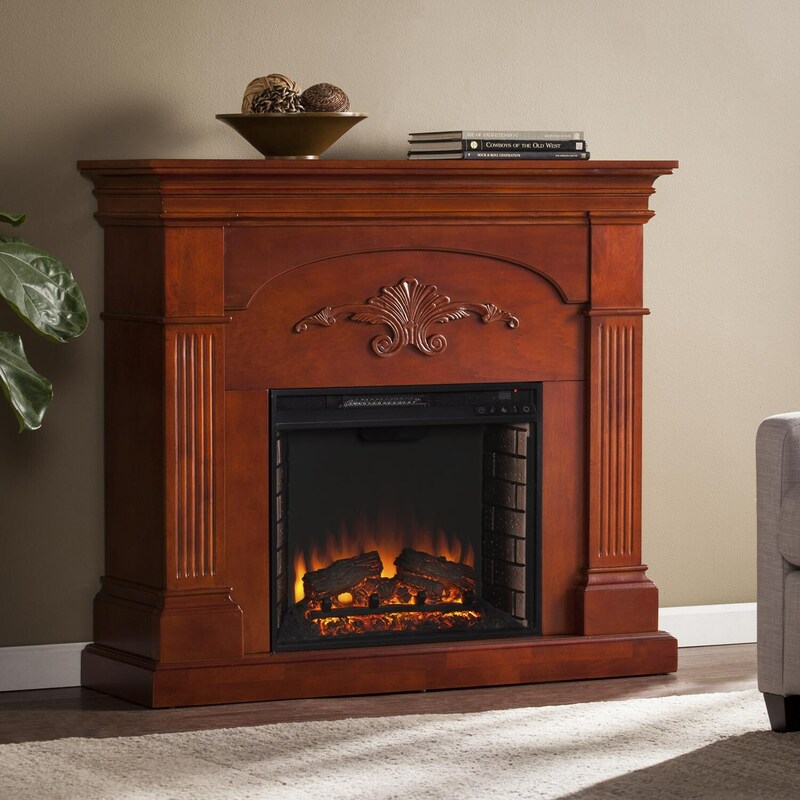 We're here to help you through the process of shopping for your electric fireplace. We know you may not necessarily have time to compare every electric fireplace and learn all of their features. To make things easier, we've taken the time to test and review our most popular electric fireplaces, and you can view them at our Electric Fireplace Expert Reviews page. To compare warranty information on our electric fireplaces, consult our fireplace warranty charts. For detailed warranty information, please see user manuals. If you need help deciding, call one of our electric fireplace experts at 1-877-743-2269!